The north-eastern Indian state between Nepal and Bhutan voted to join India in a referendum in the mid-1970s and New Delhi had little choice but to integrate the former Himalayan kingdom. It is hardly surprising that an overwhelming majority of Crimeans voted to rejoin Russia in a referendum conducted on Sunday. It was a travesty of justice that the region, which has been culturally and historically Russian, was in Ukraine in the first place. Whatever arguments one makes on international law and territorial sovereignty and integrity, the fact is that it is next to impossible for Russia to ignore the genuine aspirations of people who want to be part of what they consider their motherland. Besides, if the governments in the US and EU truly believed in the importance of international law, the world would have witnessed far fewer wars in the last two decades than it, almost all of which were at the behest of the West. Where was the principle of international law when a democratically-elected government in Kiev was recently overthrown in a coup d’etat? How can one say with any fairness that the aspirations of the people of western Ukraine are more important than those of the East or of Crimea? When Indian National Security Advisor Shiv Shankar Menon said Russia’s interests in Crimea were “legitimate”, he may not have thought of a similar situation that his country faced in the mid-1970s when a territory outside of India’s borders wanted in. 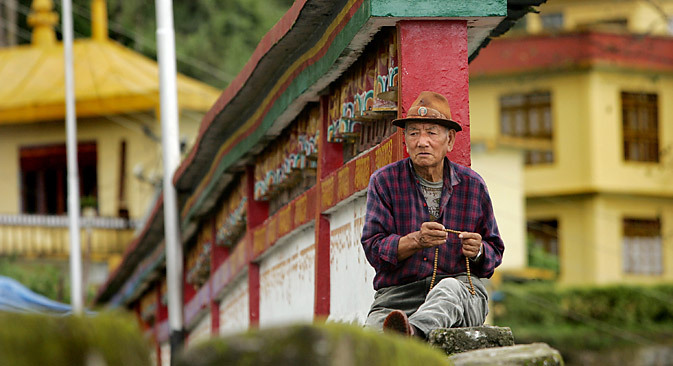 Until 1975, Sikkim was an independent kingdom, albeit an Indian protectorate. The monarchy was highly unpopular and the last King Chogyal Palden Thondup Namgyal had an American wife who seemed to have some sort of vested interests in regional affairs. There was even talk from Gangtok (Sikkim’s capital), of the Indian tea-producing region of Darjeeling being ‘returned’ to Sikkim. Strategically Sikkim, located in between Nepal and Bhutan and south of Tibet was an extremely important region for India. It was West Bengal’s only buffer from a potential Chinese sweep down. In the 1970s, not only were Sino-Indian relations at a low point, the fact that Soviet Union had virtually no influence on the Middle Kingdom made India’s security equation challenging. Similarly, in 2014, a government formed as part of an illegal coup sponsored by the West and comprising of ultra-nationalists in Kiev, wanted the Russian Black Sea Fleet out of Sevastopol. Such a move would have denied Russia access to the Black Sea and the Mediterranean. This clearly looked like a part of a strategy to encircle Russia. Just like Sikkim falling into Chinese hands would have been a disaster for India, Crimea turning into a base to undermine Russia’s Navy was a serious threat to the country. On April 14, 1975, a referendum was held in Sikkim, in which the people voted to join India and it became an Indian state, a month later. This referendum was recognised by the United Nations and most of its members, although China flat out refused. I travelled around Sikkim in the early-2000s and spoke to many people from that generation who voted to join India. They spoke of the fear of a Chinese takeover and losing their freedom of religion. The knowledge of the Cultural Revolution in China was widespread in the state and the Sikkimese genuinely worried about a similar scenario. Many also spoke of the great sacrifices that the Indian Army committed to defend the state in the 1962 War and protecting the Nathu La Pass. Integration with India turned out to be a blessing for the state, which now has some of the highest human development and hygiene standards in all of Asia. While the referendum in Crimea may not gain immediate international acceptance, there is precious little the West can do to reverse it. Sanctions can be imposed two-ways and let’s face it: the large US-based multinational companies do not want to get kicked out of a market of 140 million people. In these times, when the global economy is still not in a good shape, these corporations that lobby at the highest corridors of power are not going to take such a huge financial hit. Europe cannot in the foreseeable future do without Russian gas, and well, we all know how the ethical bankers of London will say no to Russian capital! How much of a role does international recognition play on the status quo of a place? The US may not recognise Kashmir as an integral part of India, but that won’t stop many of us in India (or America for that matter) from visiting the beautiful city of Srinagar or the Kashmir Valley. There was a time when Chinese suzerainty over Tibet was not recognised by many countries, but if anyone wants to know what the world thinks, they just have to buy a map printed in just about any country. If there’s one thing Vladimir Putin has shown, he will defend Russia’s interests at any cost. The days when Russia was a whipping boy of the West and was offered carrots in the form of memberships to clubs like G8 in return for working against its own national interests are long gone.